(Above: JFK and McGeorge Bundy) JFK might have approved this language but he never had a chance to see it. Two days later, while Kennedy’s body lay in state in the Capitol Rotunda, President Johnson ordered Bundy to completely strike paragraph seven and rewrite it to allow direct American military attacks against North Vietnam. The first American navy “Desoto” patrols along the North Vietnamese coast began a few weeks later. 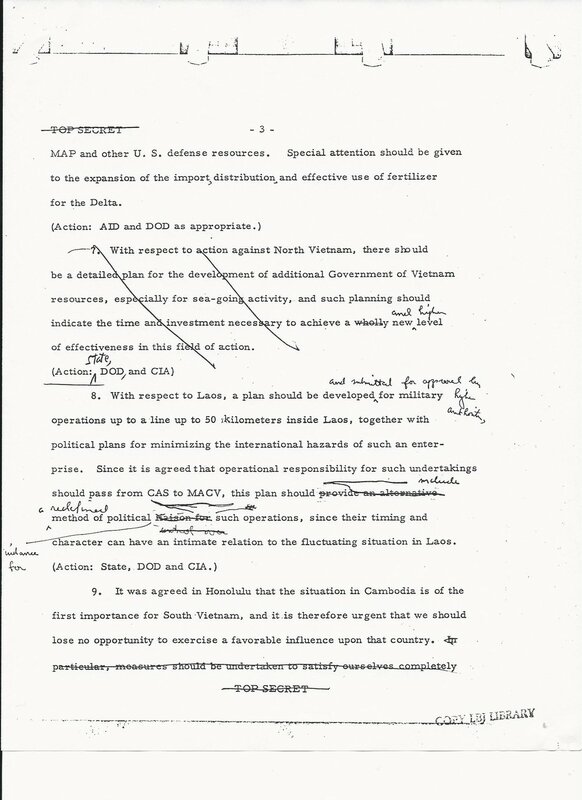 By the summer, these actions provoked the Tonkin Gulf Crisis and the passage of a congressional resolution permitting LBJ to do whatever was necessary to defeat North Vietnam.